it's gonna be a par-tay!! For starters, I’m THRILLED to report that Gabe’s cardiologist gave him TWO THUMBS UP for the Cambodia Trip (thanks for all the Facebook love you shared when I made the announcement earlier today). All praise and glory to God!! I don’t even know what else to say. Yet here I am, feeling overwhelmed and stressed tonight. I KNOW worry isn’t part of God’s plan for my life. And I KNOW that I JUST got done talking about some highlights of God’s crazy-awesome provision. So, why on earth would I act like an Israelite who just walked across the Red Sea on dry land and start whining that God forgot about me?? Would love your prayers that I can keep my eyes fixed on Jesus and not be distracted by stuff that doesn’t fit in suitcases and too many people that I love and want to see before we go and money bothers and how am I going to get everything done?? God is good. And he provides. And protects. And loves me like nuts. And that’s all I need to know. And goodness, if I wasn’t sure he wanted us to go to Cambodia before (and I was pretty stinking sure), I am now. Heart attack? Whatever. I started writing a post in my head today (and then scrawled some notes in my journal) about our goals (and not-goals) for this trip. 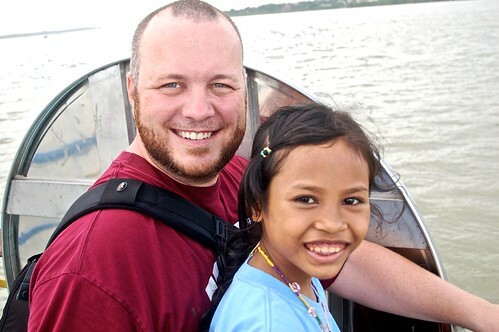 Our one big goal: we want to be Jesus to the people we meet in Cambodia. That’s all. Just be Jesus. Not big white Santas tossing gifts at “poor orphans.” But taking time to love and touch and build relationships (and a bunch of other lovely ideas that I’ll write about soon if I can read the scribbles in my journal). Oh, but make no mistake. There will be gifts. And a boat ride. And a dance party. And fried chicken and Cokes all around. 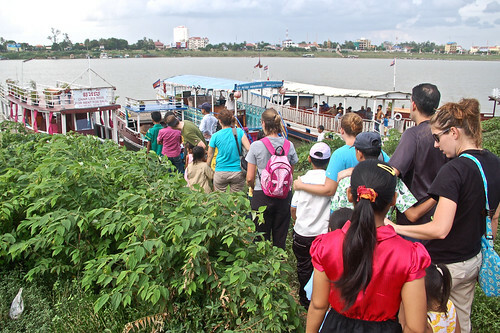 One of the highlights of our trip last time was taking the kids from our orphanage on a boat ride and then out for a meal at Chicken World (or whatever it’s called). I can’t WAIT to do it again. And with our girlies! And our friends Keri, Scot, Garrett, and Nathan from Houston/Singapore! We’re not sure exactly how much it will cost to do a boat ride, big meal out, dance party, and maybe something for Jesus’ birthday. We’re estimating about $500 total. And John McCollum, the Director of Asia’s Hope, kindly set us up with a little Taviano Activity Fund that you can donate directly to if you’re so inclined (any excess money will go to wherever Asia’s Hope needs it most). And you can be sure we will take photos (and videos!). And based on the smiles and giggles and hugs and belly laughs from last year, I think your gift, no matter how small, will be multiplied and remembered and cherished for a long time to come. Just click the button to donate. E-mail me with questions. (All gifts are tax-deductible.) Bless you, friends! Hey Marla! I have been reading your blog and facebook constantly through these last few weeks. I want you to know that I’m going to be praying for you wholeheartedly while you’re in Cambodia! I pray that they will meet Jesus, and that God will sustain you, Gabe and your daughters. I was so blown away by Livi’s confession of hearing God speak to her – that has really stayed with me, and I pray she never loses that relationship with God! You are SUCH a sweetheart, Hannah!! Thank you so much ofr your prayers!! Did you enjoy your time in the States?? I LOVED my time in the States. Second time to New York is still amazed by it. I SO hope you have a fantastic time and I really can’t wait to see photos and hear how you’re going! Also – your content about ‘Purging’ has been so refreshing! I’ve just been helping a friend pack and move and seeing the amount of stuff we accumulate (but hide in boxes/cupboards etc) is crazy!